"With the free valuephone Shopping Lists Manager shopping is fun! Create and edit shopping lists as you please, clearly organize them and have them available at any time. By simple checking off the items are marked as "Got it" and can just be hidden, if desired. With the free registration with the associated portal www.valuephone.com you even get the opportunity to conveniently create shopping lists at your PC and to synchronize them with two more mobiles." 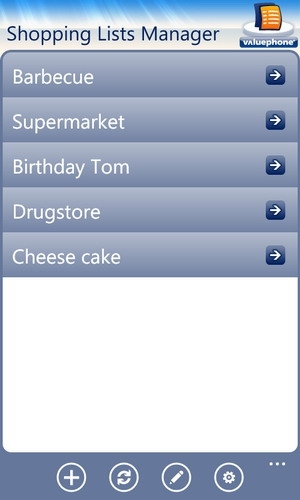 Valuephone has just released their Shopping Lists Manager application for Windows Phone 7. One of the advantages of Shopping Lists Manager over other competing shopping list applications in the marketplace is the ability to create and edit lists from your PC for sync to multiple cross platform devices. Registration on their website is free as is their application available in the WP7 Marketplace.